Our mystery seeds from last week arose from a simple question: What is in the bird seed we are feeding our birds? With some detective work, we found out that the smaller, shiny white or light-colored seeds are white proso millet, Panicum miliaceum. 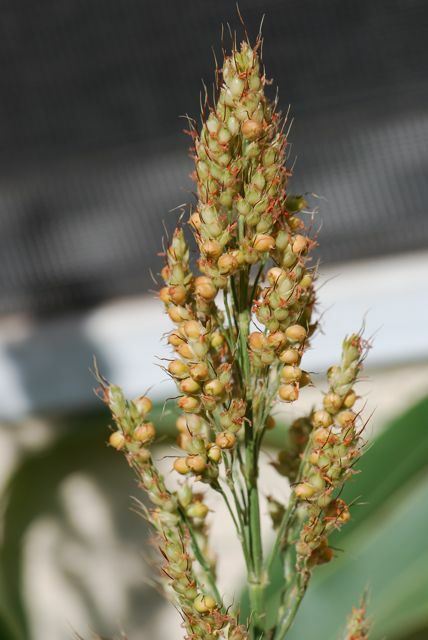 The bigger, red or orangish seeds are from sorghum (also called milo), Sorghum bicolor. 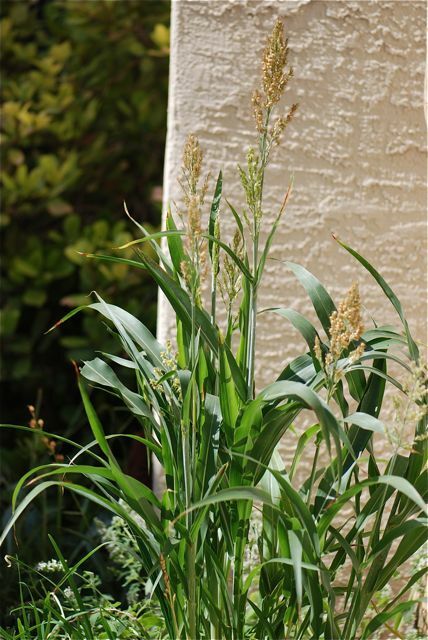 Sorghum has broad leaves that may resemble those of corn plants. 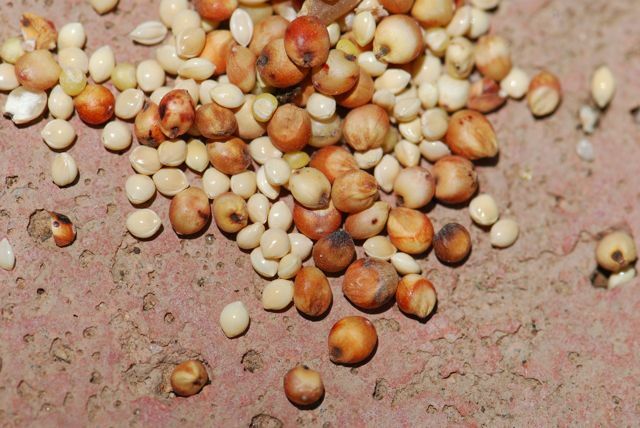 The sorghum seeds start pale and then darken with time. Studies have shown that different birds prefer different sizes and types of seeds. In our yard, most of the ground feeding species, such as mourning doves, inca doves, white-winged doves and sometimes curved-bill thrashers, will eat the millet and sorghum. Refer to Birdzilla for more information and pictures of different types of bird seed. 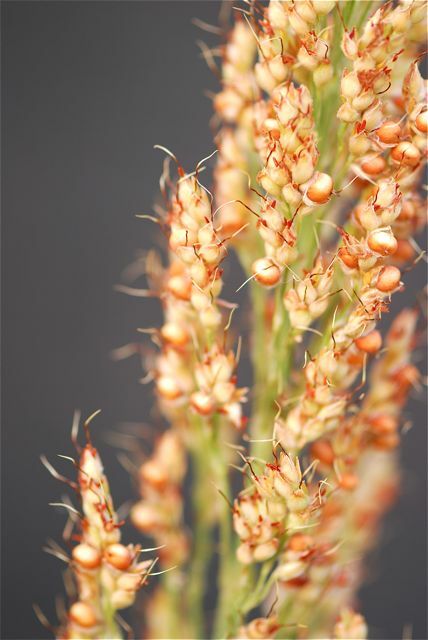 Sorghum was thought to have come from northern Africa and it grows remarkably well in dry areas. In fact, it can grow where there is too little moisture for corn to grow. Although the leaves are large, it has an extensive root system and the leaves are waxy, to prevent water loss. It also can go dormant during periods of drought. 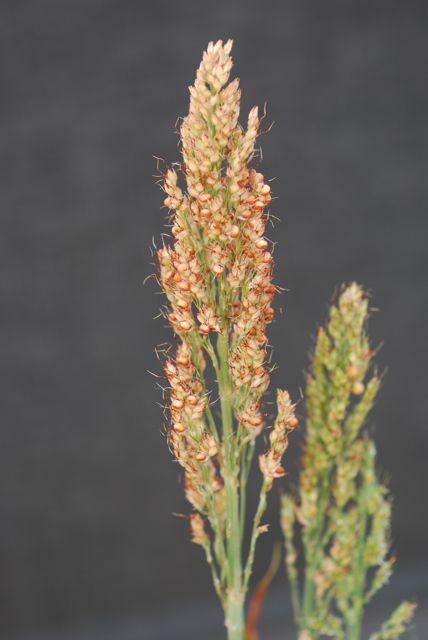 Apparently the leaves can contain too much prussic acid (hydrogen cyanide), and can be toxic. The foliage is converted into silage before being fed to animals to prevent prussic acid poisoning. What kinds of seeds to you feed your birds? We have hummingbird feeders for our broad-tailed and rufous hummingbirds, and then I decided to branch out. I wanted to attract the smaller birds in the area. I asked at a store in Texas and they suggested safflower seeds, to keep away the squirrels. We have lots of them. So far, I haven't had any birds visit. I think I should change to sunflower seeds, according to Birdzilla. Thanks for the link! Good luck attracting birds. Sometimes it takes a little while. We put out thistle socks with nyjer and have had great success attracting finches. The birds definitely prefer the sunflowers from our birdseed mix. We were happily surprised to find grass growing in our dry Northeast Texas dirt due to the sorghum dropped under the feeders!